The 41 year old Floridian (a term derived from the Spanish word for "batshit"), Melissa Miller, was arrested in Fort Pierce, Florida at 1 am on Tuesday, after attempting to flee police by increasing speed and swerving into oncoming traffic lanes. 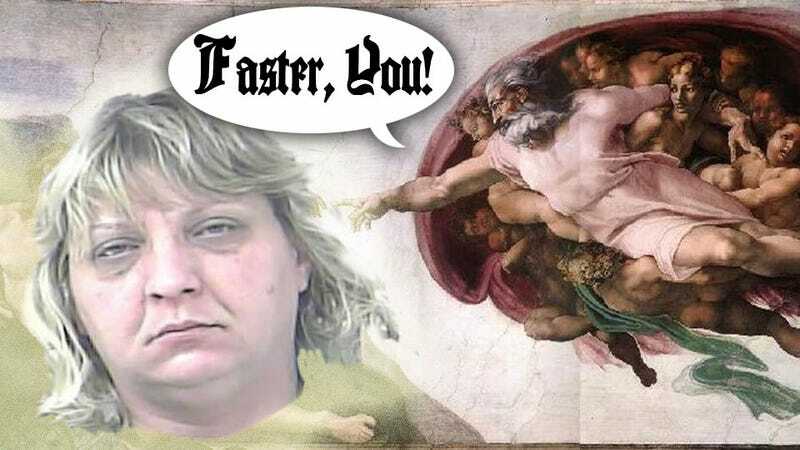 When finally caught, she freely admitted driving her silver Toyota at a high rate of speed, saying "because I was letting the Lord spirit guide me," and blamed the horn blowing on "the Lord telling me to do it." Theologians confirm that while God does not normally suggest speeds to motorists, it's possible that having Florida's most bonkersest residents hurtling around at a high rate of speed may be part of a larger plan on behalf of the Almighty. As of press time, God had not returned requests for comment.